Ann is not sure how the it got started but most likely it was a Courant editorial dated December 7 and titled Exceptional Miss Uccello. In any case a committee was formed to come up with an appropriate way to honor Ann’s achievements. 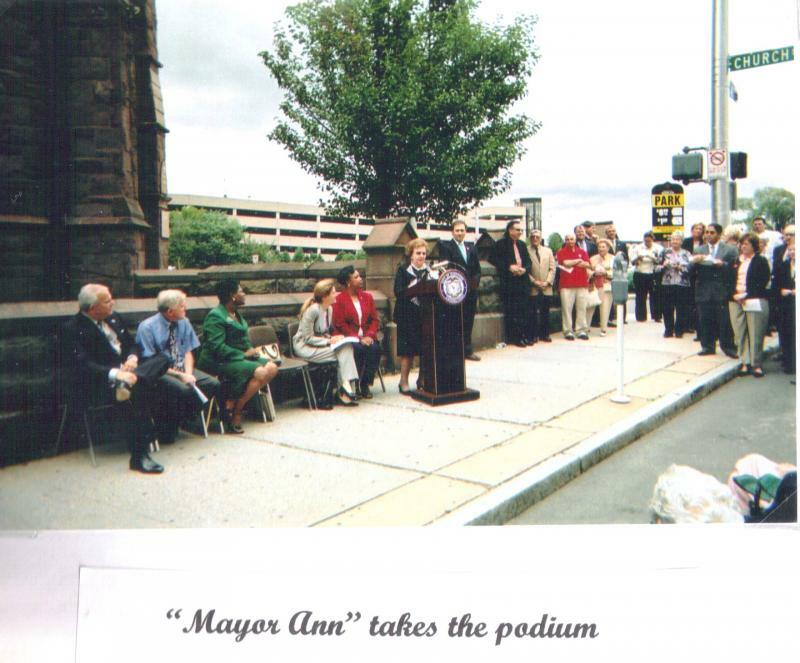 The first alternative was to name the fountains in front of City Hall after Ann! That in honor of her efforts to get the water running again in those same fountains by organizing the Fountain Balls to raise money for the project. Another idea would have called for a statue to be built but Ann rejected that idea out of hand. She asked her nephew David to mention to the committee the idea of naming a street after her and specifically Ann Street which was so dear to her from her days as a youthful school girl and her days working at G.Fox! The committee agreed and so was born Ann Uccello Street!